Everybody associates handicrafts in Kashmir for kashmiri carpets, but there’s a whole lot besides. 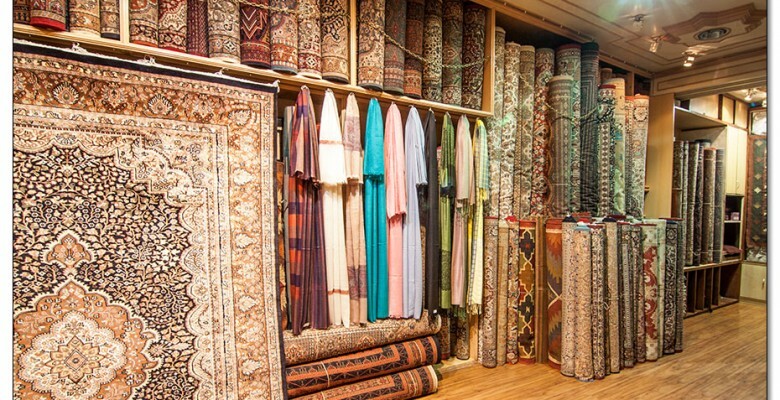 Kashmiri carpet or rugs are basically handmade. They are available in different sizes, colors, designes and prices. Depending on the quality of your purchase, you can pay different. Many qualities exist side by side in Kashmir to suit a variety of budgets. There are a pure wool kashmiri shawls called raffal which have different counts of wool – 40, 60, 80 etc., and the shawl is progressively more expensive as the counts increases. Shawls mixed with other fibres like cotton and cotton derivatives are far cheaper. On the other hand, woollen shawls mixed with pashmina will be far more expensive. Then too, there are shawls that look and feel like pashmina and which are priced between wool and pashmina. Naturally a pure pashmina shawl will run into thousands of rupees. Depending on the count, two similar looking pashmina shawls will differ in price if they have a different count. And then there are the embroidered shawls. Embroidery is of two kinds – hook and needle, and the former is generally less expensive than the latter. As a general rule, the better the material of the shawl, the better the embroidery, with pashmina having the tiniest stitches in needlework, and the less expensive mixed woollen shawls having either hook work or somewhat coarser needlework stitches. Some shawls have gold zari embroidery worked on them in hook work and are highly prized. 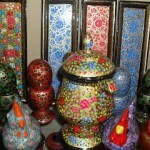 Here too, the quality of kashmir paper mache products differs markedly, depending on two factors. The fast is the papier mache in its raw state. Unless it is smoothened adequately to be silky to the touch, it is not considered high grade. On the other hand, inexpensive papier mache, brightly printed and varnished, makes a variety of gifts and souvenirs that do not cost a fortune. Eggs, egg cups, candle and pen stands, kum kum boxes and cigarette boxes are just a few options at the low end. At the other end of the scale, high grade papier mache is used to make vases, bowls, trays and a number of other products all printed by expert craftsmen in lifelike images of kingfishers, chinar leaves and other motifs. Gold used on these products will be real gold leaf. On lower range products it will be poster paint. The real difference however, lies in the skill of printings and not in the product itself – two trays or vases can appear roughly the same at first glance – it is the execution of the printing and the type of gold used that will determine the price. One may be a collector’s item, the other an inexpensive souvenir. Items made from walnut wood come from three parts of the tree: the branches, the trunk and the root. The branches have the palest colour of the wood, and the trunk the darkest. Branches have no veins, trunks have the strongest marked veins. 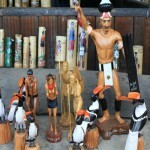 Objects made out of the root will be the costliest because of the wood used. As walnut is a soft wood, it takes carving very wall. Chinar leaves, vine leaves and flowers can be either carved along borders or can fill entire surfaces. 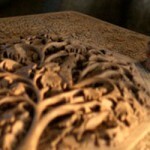 The artistry of the carving and its abundance dictates the cost. Trinket boxes and the larger jewellery boxes should have invisible seams. Other walnut wood objects are salad bowls, nut bowls, photo frames, trays and furniture. This can range from a simple telephone stand or nesting table to a dining table with six chairs. In the case of furniture, the price is dictated by the thickness of wood used. Two very similar writing desks can be priced very differently, if one used 3/4″ wood and the other 1/2″ wood. The difference is barely discernible to the untrained eye, but no dealer will sell precious root wood, 3/4” thick for the same price as his competitor who has economized on the quality and quantity of wood for a cheaper product. Surprisingly strong, wicker basket can be used as picnic hampers, lampshades, glass holders for holding hot tea , work baskets , even packing cases which can be sent unaccompanied by road . The main centre of this craft is at Hazratbal in Srinagar. Kashmir’s willow is so highly prized, that most of the national teams uses cricket bats from Kashmir. 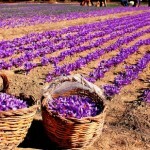 Other products of Kashmir include saffron, grow in Pampure on the way to Pahalgam. It is one of the only two places in India where saffron is grown, the other being Kishtwar, also in Jammu and Kashmir. This expensive spice, requires only a few strands to flavour a dish serving ten people and hence you need to buy very little of it, 5 or 10 grams being enough for several years. Preserved in airtight containers in cool dark place, saffron can keep indefinitely and hence is an excellent buy, Walnuts and almonds are available in the market throughout the year. Being substantially cheaper in Kashmir than elsewhere, they too make good gifts. Other food products from Kashmir Shah Zira (also called Kala Zira), Kashmiri chillies and honey. 1. Lal Chowk is famous for walnut wood carved articles, paper mache and kashmiri handicrafts. 3. Tibetan Market is famous for wool garments. 4. Moti Market is famous for wool garments. 5. Badshah Chowk is famous for kashmiri carpets. 6. Residency Road is the best market for dry fruits, kashmiri handicrafts and ethnic ongra jewelries. 7. Polo View Market is famous for pashmina items. 8. 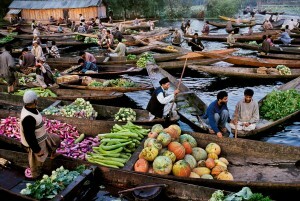 Floating Vegetable Market on the Dal Lake is famous for selling fresh vegetables and flowers. This entry was posted in Jammu & Kashmir, Shopping, Shopping In Jammu & Kashmir and tagged Shopping. Bookmark the permalink.